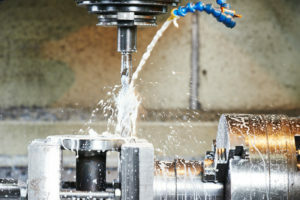 CNC machinery has come a long way since the early machines of the 1950s. Punch tape numerical controls used to be what every manufacturer offered. These have gradually evolved into several different codes, and were even replaced by the universal programming language G-code. With this shift in control languages and controllers came fully digital computers. The development of new software systems slowed down but resurged in the early 2000s. While G-code continues to be part of CNC machining, new industry leaders and the developments in machine center technologies in recent decades have led to competing machine manufacturers using proprietary programming methods. Regardless of manufacturer, several new concepts and programs have risen in recent years. An advancement in CNC machinery technology saves companies time and money by lessening scrap and reducing damage to machining centers through simulation, verification and optimization software. Several companies provide these software packages, including innovative and unique features in some, but generally offering common basic abilities. These software packages make way for simulating the machining of a new part, verifying tool paths to reduce crashing and collisions, and optimizing production. These also help in eliminating any surprises by allowing the recognition of discrepancies through measurement and analysis. Developments in machining center control software have been extensive, yet smarter software demands smarter hardware. For effectively implementing adaptive control and condition monitoring, additional sensing probes and hardware had to be used on workpieces, tools and the machining center as well. It was inevitable that the Internet of Things and big data would reach machining and manufacturing in general. In part of the Industry 4.0 initiative, companies are making additions in control levels, automation and data collection over their processes and machines. This initiative, frequently referred to as the smart factory, has an end goal of having improved communication between machines, and between machines and humans, by leveraging machine learning algorithms, wireless technologies and other technological developments. This can provide new insights into machining processes and business practices with improved abilities to analyze and interpret huge amounts of data. Additionally, it allows more deliberate and effective maintenance, reduced waste of materials and time, and better quality, more complex parts. Contact N&S Flame Spray for more information. We are a machine shop that specializes in nickel hard coatings. We are mainly oilfield related.